What do the different buttons in Volleyball Playview actually do? • The Plan & Play Library. • And the Animated play or drill screen. For a practice plan, the date, start and finish time will be visible. If available the team and place of practice will be shown too. 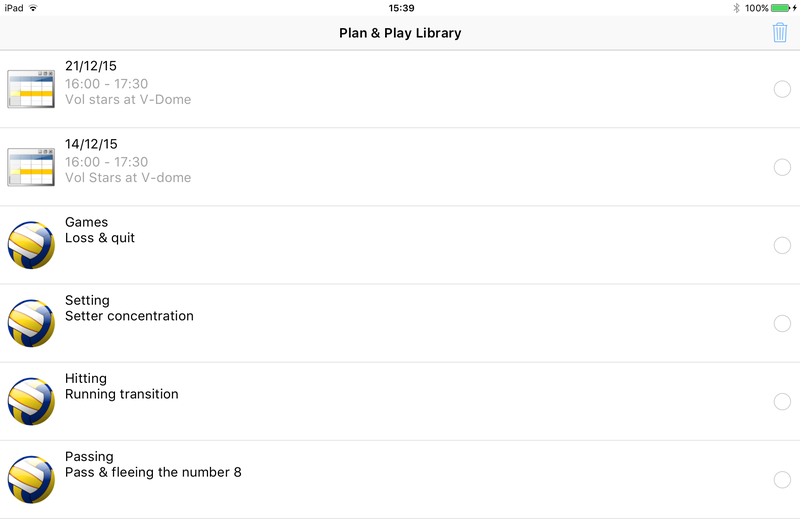 Tap on a practice plan will open the Viewing list. For a single play or drill the category and play name are visible. Tap on a single play or drill opens the Animated play or drill screen. The trash button will be enabled when one or more practice plans or plays are checked. Tap on the trash button will pop up a question which will allow you to delete the selected practice plans and plays. When a practice plan is loaded the header of the viewing list will show the team, location, date, start and finish time of the practice. 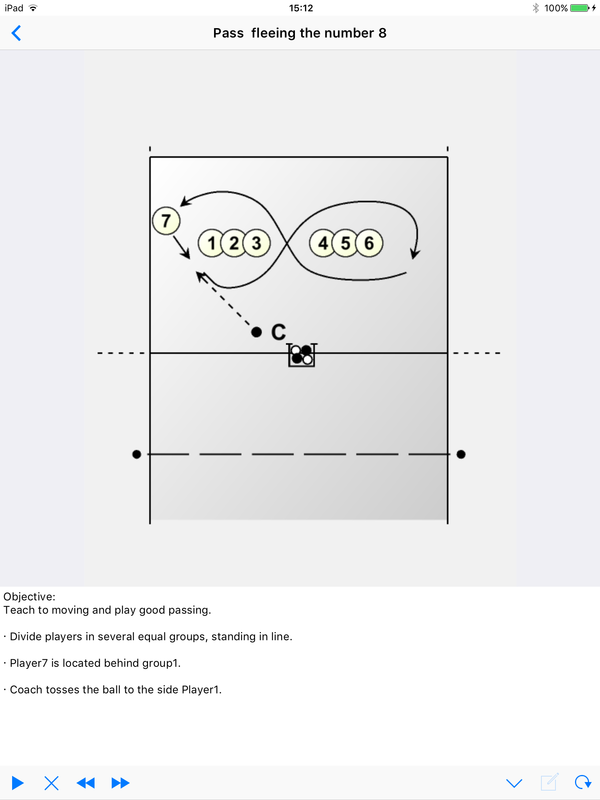 The list itself contains the individual drills and plays that make up a practice. If the time, number of players and number of balls are available they will be shown a well. Tapping the back button will bring you back to your Plan & Play Library. The final screen allows you to show and animate the selected play or drill. Tapping the back button will bring you back to the Viewing list. The play button will start an animation when available. The pause button will pause the animation at its current position. The stop button will stop the animation and bring you back to the first sketch. The previous button will stop the animation and bring you back one sketch. The next button will stop the animation and bring you forward one sketch. Tapping the hide button will hide the text; this button is only available in portrait mode. Tapping the show button will show the text; this button is only available in portrait mode. If the sketch button is down, all movement and passing lines are visible and the animation will stop/pause at each sketch with lines. When the sketch button is not down the animation will be continuous and in combination with the loop button repeated. Text will not be updated. If the loop button is down, the animation will be repeated. all movement and passing lines are visible, the animation will stop/pause at each sketch with lines. If the sketch button is down the animation will be pause at a sketch with movement/passing lines or text.